This antibody was initially identified as directed against a nuclear pore complex antigen by immunofluorescence localization. A screen of a lgt11 expression library yielded a single positive clone carrying an insert bearing ~66% of the C-terminal portion of NSP1. To confirm that 32D6 possessed high affinity for NSP1, strain RS453, which expresses a shortened isoform of NSP1, was compared to the wildtype strain BJ5465. NSP1 in RS453 contains an internal deletion that removes the coding sequence for 6 FXFG repeats, which are not essential for function and encodes a protein that has been observed to migrate at approxmately 85 kDa on SDS gels. The predicted size of wildtype NSP1 is 86.5 kDa, but NSP1 has been observed to migrate on SDS gels at ~100 kDa. In our gels, the apparent molecular mass of wildtype NSP1 was 108 kDa, whereas the short isoform of NSP1 in RS453 migrated at 91 kDa. The detection of two protein bands of apparent sizes 108 kDa and 91 kDa in BJ5465 and RS453, respectively, demonstrated that 32D6 recognized the pore complex protein NSP1. This was raised against a yeast nucleolar prep, and screened by immunocytochemistry and western blotting. This antibody is a useful marker of yeast nuclear pores. Our Abpromise guarantee covers the use of ab4641 in the following tested applications. WB 1/10000 - 1/50000. Detects a band of approximately 108,91 kDa (predicted molecular weight: 85 kDa). 1/10000 (cell lysates) - 1/50000 (nuclear fractions). For other (non-ECL) detection methods, 1/1000 - 1/5000. 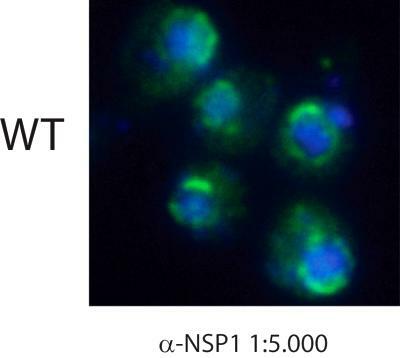 NSP1 functions as a component of the nuclear pore complex (NPC). It plays an important role in several nuclear transport pathways including poly(A)+ RNA, tRNA, pre-ribosome, signal recognition particle (SRP), and protein transport. Nuclear membrane: part of the nuclear pore complex, it presents a symmetric distribution with a cytoplasmic and a nucleoplasmic side. 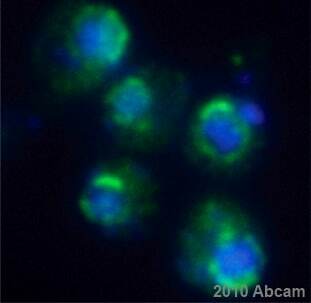 Immunocytochemistry/ Immunofluorescence - Anti-NSP1 antibody [32D6] (ab4641)Image courtesy of an anonymous Abreview. ab4641 (1/5000) detecting NSP1 in Saccharomyces cerevisae DDY1810 (green). Cells were fixed in paraformaldehyde, permeabilized in methanol/acetone and counterstained with DAPI in order to highlight the nucleus (blue). For further experimental details please refer to Abreview. Publishing research using ab4641? Please let us know so that we can cite the reference in this datasheet.